Today is one of the busiest days of my life. Having arrived in Dungun at 2 am last night, I had to then type out the recipes for my class for the next morning. It was a demonstration and lucky enough, no one noticed the tremendous exhaustion I felt (not even a yawn) that made even the wall seemed comfy enough for me to lean on relaxingly. It was a 'special cakes' class and one of the items was 'Red Velvet Cake' (I reckon that words and fashion reach across this part of the country pretty fast these days, hence, this cake has made its name here as well). Whether you see it as a stale version of chocolate cake or a cake with a bitter aftertaste (due to the beetroot juice), this cake has its own distinctive class and has made its way to the best bakery boutiques in town. It was a very hot day today. It was too hot for me to walk to the mini-mall nearby. So, my Mom dropped me off there at around 1pm today. The Easter Sale at the Christian bookstore officially started today, which was why I was so excited to go there. I've had my eye on the ESV (English Standard Version) Study Bible for a long time now. The leather edition sells for above RM224! Because of the Easter Sale discount, for a limited time, I can get it for only RM179! So, this afternoon, I headed straight to the Christian bookstore and bought it! The last pristine copy left! It's like the Study Bible was waiting for me to buy it! I'm so excited! I can't wait to delve into it tonight during my quiet time. I have extra motivation to read the Bible now! I've been rather lax lately, I hope my enthusiasm lasts though! Heck! I'll make it last! I've never read the Bible cover to cover in all my years as a Christian, well, this is the year I'll finally succeed! Anyone can get used to anything, even if it is unpleasant or difficult. That's what I found out during my years as a dialysis patient. I've been a dialysis patient for 6 years and counting now. At first I encountered less problems (after I got free of my IJC : which is the tube inserted into my jagular vein, that is, my neck before my arm access matured), as my body was still new to dialysis. But now, going into my 6th year, my heart is not as healthy as it once was, and the phosphate, calcium & potassium levels have accumulated in my blood due to careless eating. Muffins are one of my favourite comfort foods as they are effortlessly easy and breezy to prepare. Such lovely, fluffy and crumbly cupcake-like goodies make excellent breakfast, kids' lunch and even picnic munchies. Spruce them up with blueberries, oatmeal, dried fruits for that ultimate guilt-free snack that pairs beautifully with a steaming cup of coffee in the morning or those fancy-flavoured tea in the evening. 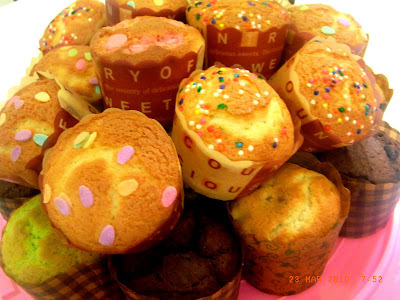 Muffins can be prepared in 2 ways - Creaming method & Muffin method. Personally, I prefer the latter as they are more traditionally 'muffin-like' (crumbly and has more substance unlike the more cake-like and fluffy nature of the other type). However, my kids love the cake-like muffins and fortunately, I have an excellent fluffy muffin recipe that I can play with to get as many flavours and colours possible! 1 recipe many variations...time-saving indeed. How can I NOT write about durian again when it is still in season! Its provoking smell (I find it gorgeously fragrant while others may find it unbearable offensive!) has tempted me to bake yet another favourite. I managed to get some of those striking golden pulps again (one of the best grades of durians) as I was driving along Dungun road. For today, it’s Durian baked cheesecake. 2. For the base, mix the sugar and crushed biscuits. Add melted butter to it and mix well. Press mixture into mould. 3. Beat the cream cheese at slow speed until it becomes a smooth mixture.